1 of 5 Heat oil in a saucepan (not more than half full) over medium-high heat to 365 degrees on a deep-fat fry thermometer. Adjust temperature under pot to maintain 365 degrees . 2 of 5 In a large bowl, whisk together the bread crumbs, Cajun seasoning and salt. Heat oven to 200 degrees . Line a large baking sheet with a double layer of paper towels. 3 of 5 Toss 1/3 of the shrimp with egg whites. With tongs or a slotted spoon, transfer shrimp to bread crumb mixture and toss to coat. Fry in 365 degrees oil for 2 minutes. Remove with a slotted spoon to papertowel- lined sheet and keep warm in 200 degrees oven. Repeat twice more with remaining shrimp, egg whites and bread crumb mixture (you will have egg white and bread crumbs leftover). 4 of 5 Fry shrimp in 2 more batches, letting oil return to 360 degrees to 365 degrees before adding next batch. 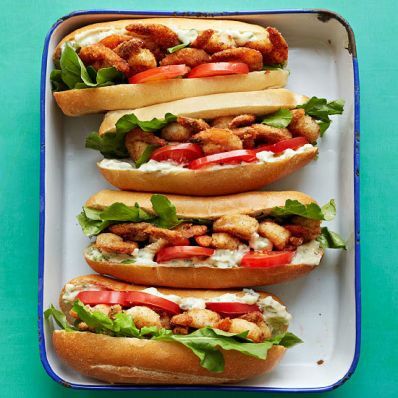 5 of 5 Meanwhile, spread 1 tbsp tartar sauce on each hoagie roll or Italian bread section. Top each with 1/4 cup arugula leaves, about 8 shrimp and 2 tomato slices. Sandwich and serve. Per Serving: 42 g carb., 3 g fiber, 175 mg chol., 4 g sat. fat, 33 g pro., 809 mg sodium, 23 g Fat, total, 501 kcal cal.